Almost 110 years since its first mintage, the wheat penny remains a staple of coin collections and a favorite among beginning collectors. Minting of the wheat penny began in 1909 and extended all the way until 1959, when it was replaced with the Lincoln Memorial penny to celebrate the fiftieth anniversary of the wheat penny. 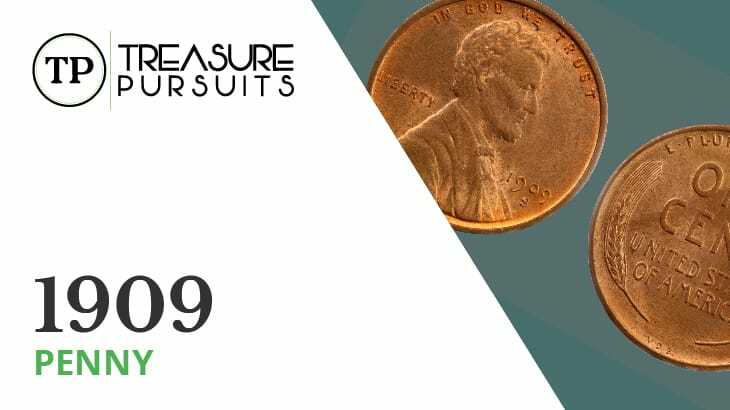 The coin was designed by Lithuanian medalist Victor David Brenner, whose simple obverse face design has remained largely unchanged throughout the various iterations of the Lincoln cent. 1909 was the centennial of Abraham Lincoln’s birth. President Theodore Roosevelt, in order to commemorate Lincoln, who was a personal idol of his, commissioned the creation of a cent piece with Lincoln’s portrait. This was the first time that a real person had appeared on U.S. coinage (outside of the commemorative Columbian half dollar, which featured Christopher Columbus). Prior to the wheat penny, only animals and fictitious figures like the Native American on the Buffalo nickel and Liberty on the Morgan silver dollar had been seen on U.S. coins. As part of the original reverse design, Victor David Brenner included his initials near the lower rim, below the wheat. Many felt this was too bold of a design choice and wanted to remove the initials entirely. By August of 1909, new designs with no initials were already being minted. These varieties will be discussed further in the next section. 1909 wheat pennies were only minted in Philadelphia and San Francisco. In Philadelphia, 100,697,618 wheat pennies were minted. In San Francisco, only 2,309,000 were minted. Compositionally, the 1909 wheat penny is 95% copper and 5% tin and zinc, which is standard for wheat pennies. Also standard for wheat pennies are the 1909 cent’s mass of 3.11g and diameter of 19mm. Thanks to the controversy with the designer’s initials and a minting error on San Francisco coins, there are five main varieties of the 1909 wheat penny. The first and most common variety is the Philadelphia mintage with no initials. The second variety is the Philadelphia mintage with the initials. Philadelphia mintages display no mint mark. The third and fourth varieties are the San Francisco mintages with and without initials, respectively. The San Francisco coin with the initials is considered rare, only 484,000 being minted in 1909. San Francisco mintages are identified by an “S” below the year on the obverse. The fifth variety, which is likely the least common variety of 1909 wheat penny, is the result of a minting error. Minted in San Francisco, the “S” has been struck twice, and the original “S” can be seen through the second. The value of the 1909 wheat penny is dependent not only on the grade but also the mint mark and variety. San Francisco mintages generally bring much higher values, as do the varieties with initials. For Philadelphia mintages with no initials, Good to Extremely Fine grades are valued between $3.50 and $6. This increases to $12 in About Uncirculated, $18 in Uncirculated (MS-60), and $21 in Uncirculated (MS-63). Proofs may be worth as much as $679. Philadelphia mintages with the VDB initials are worth a bit more: between $11 and $18 for Good to Extremely Fine grades, $22 for Uncirculated (MS-60), and $31 for Uncirculated (MS-63). Proofs can be worth $2,824! The value of San Francisco coins is quite a bit higher. For the mintage without initials, Good and Very Good grades bring a value of $100-110. This increases to $153 in Very fine, $231 in About Uncirculated, and $335 in Uncirculated (MS-60). The variety with the double “S” strike mistake is worth around $5-10 dollars higher at each grade than the San Francisco mintage without initials. The San Francisco mintage with initials is the most valuable by far. Good grade coins are worth $765, and Very Good grades are worth $849. The value increases dramatically to $1,024 in Extremely Fine. About Uncirculated coins may be worth up to $1,500. Lower grade Uncirculated coins are valued at $1,708, and and Uncirculated (MS-63) grades are worth $2,057. In 2018, a MS-66 grade 1909-S VDB coin sold for $4,150!